JEAH Review 2019: Is JEAH a Good Hosting? With a long track record and top-shelf infrastructure, JEAH should be one of the first hosts to consider if you require UNIX hosting with full shell access. The company offers competitive rates and simple pricing plans that will appeal to most customers in this niche. JEAH is a New York-based hosting company with servers housed in the famous 111 8th Avenue Building along with big-name companies like Google and DigitalOcean. It’s been around for quite some time — since 1999, in fact. JEAH operates a highly secure facility with redundant power supplies, top-level security, and 24/7 monitoring by technical experts. The company offers 100% UNIX-based virtual hosting as well as shell account access, mostly for those who want to run bots or similar programs. JEAH’s hosting is 100% based on UNIX using the FreeBSD operating system, widely known as the most stable and secure of all the UNIX variants. This, combined with the company’s special DDoS countermeasures, ensures a secure environment for your web hosting solution. JEAH also claims to have a “two-minute rule” for acting on any detected threats. JEAH doesn’t provide any control panel, so this platform may not be the most beginner-friendly. However, it does provide its customers with the tools they need to access their server. For example, it provides full shell account access as well as access to the server using telnet, SSH, SFTP, FTP, remote WebTelnet, and access to all other shell programs and compilers. Perl, CGI, PHP, SSI, and MySQL are all supported. You can also opt to have WordPress, Joomla, Drupal, and Wiki installed for you, although this will come at an additional cost. JEAH’s highly secure data center is backed up by a powerful network with 1Gbit connections to Level 3 transit providers, such as Cogent and Telx. The company only makes use of Cisco routers with 100mbps Category-5(e) wiring. JEAH’s web hosting catalog consists of four relatively straightforward plans. You’ll find that prices are in the mid-range and start a fair bit higher than what can be considered “cheap” hosting. However, it’s very competitive considering that JEAH is a highly specialized hosting service. The most expensive plan comes with unlimited email accounts, forwarders, and subdomains. These are limited on the lower-tier plans. You can choose from monthly, quarterly, and yearly billing cycles. Note, though, that all monthly plans come with a one-off setup fee while annual contracts are discounted with all but the cheapest plan. Be sure to factor in the cost of domain registration and SSL certificates, as you’ll have to procure these elsewhere. JEAH also offers a decent selection of payment methods with credit cards, checks, money orders, online orders, PayPal, and Western Union. Unfortunately, JEAH doesn’t offer refunds for any reason. JEAH provides contact details for email, tickets, and the phone. 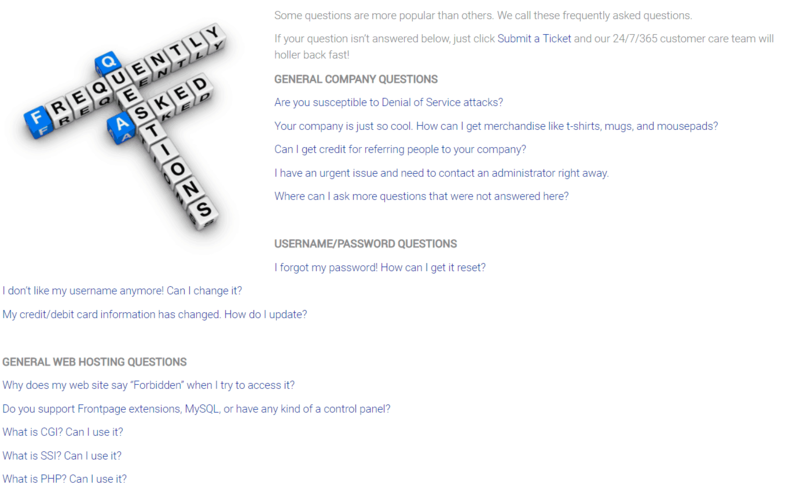 Ticket support is 24/7/365, but live chat is subject to business hours. To be honest, despite the company’s claims of “abnormally responsive support,” JEAH’s support isn’t the best and it can take very long to get a reply. On occasion, when reaching out via email support, I never even got a reply. JEAH doesn’t offer a knowledge base, but there’s a pretty extensive FAQ section. If this is the kind of hosting you’re looking for, then there are few companies with more experience or better infrastructure than JEAH. 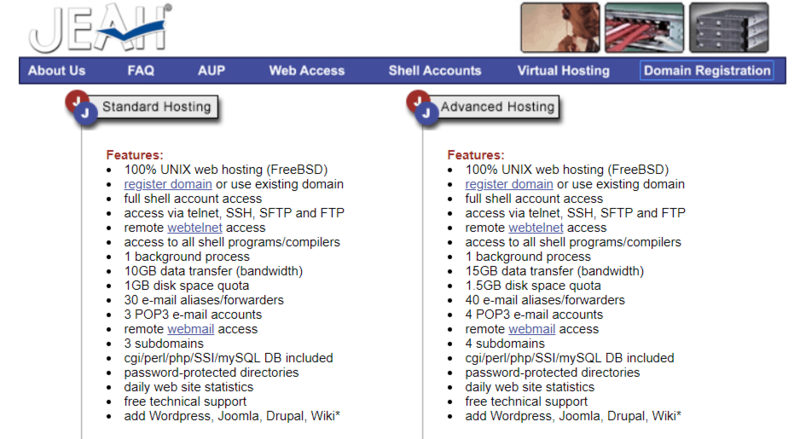 Wondering how JEAH stacks up against other Web Hosting companies? Enter any other Web Hosting company and we will give you a side-by-side comparison.